UNITED NATIONS (Sputnik) - The UN Security Council should condemn US President Donald Trump’s statement calling for the recognition of Israel’s sovereignty over the Golan Heights, Syrian Ambassador to the United Nations Bashar Jaafari said in a statement on Friday. 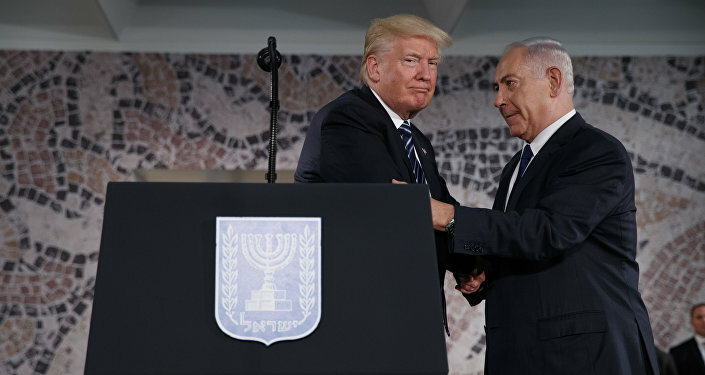 Trump said via Twitter on Thursday that the time has come for the United States to fully recognize Israel's sovereignty over the Golan Heights. “We call the Secretary-General of the United Nations, the Security Council and the General Assembly to condemn President Trump’s statement and to take all the necessary steps to ensure the implementation of the relevant resolutions in order to maintain peace, security and stability in the world,” Jaafari told reporters. Jaafari said that he expects France’s Ambassador to the United Nations Francois Delattre, who is now presiding over the UN Security Council, to take “firm steps” in condemning Trump’s statement. Jaafari referred to Trump’s tweet as a “flagrant violation” of existing UN resolutions and international law, adding that the government of the United States has no right to decide on the fate of the Golan Heights. Meanwhile, Syrian Foreign Ministry has urged the UN Secretary-General and the President of the Security Council to establish a clear official position on the status of the Golan Heights, local media reported. "Syria demands UN Secretary-General [Antonio Guterres] to take an unambiguous official stance confirming the stable position of international organizations in relation to the problem of the Israeli occupation of the Syrian Golan Heights," the Syrian Foreign Ministry's letter to the UN secretary-general and the UN Security Council president read, as quoted by the Syrian Ikhbariya TV. Damascus has called upon the UN Security Council to "take effective measures" that will ensure the fulfilment of the mandate to implement the resolutions stating that Israel has "to withdraw from the entire territory of the Golan Heights to the June 1967 line." "These are resolutions 242, 338, 497," the letter notes. According to Damascus, the US administration has no right to decide the fate of the Syrian occupied territories, and the recognition of the Syrian land under the sovereignty of another state is viewed as an act of aggression against Damascus. The Golan Heights is a strategically important land that has been mostly under Israel's control since the country seized the area after the 1967 Six-Day War. In 1981, Israel adopted a law that officially annexed the Golan Heights, but the United Nations declared the legislation as null and void and without international legal effect. Syria has repeatedly stated the Golan Heights is an integral part of its territory, and that it will work to return it by any means necessary. Pompeo Claims Trump Sent by God to Save Israel, Turkey Scolds US for Golan Hts.